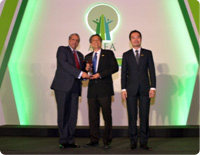 Antabax won the prestigious 2014 Asia Responsible Entrepreneurship Awards (AREA) by Enterprise Asia under the Health Promotion category for its nationwide campaign known as Antabax National Hand Hygiene Campaign 2013. This award was presented in recognition of its brand’s efforts in promoting good hand hygiene practices among school children through two major projects – Patty Cake and the reality game show, Lat-Tali-Lat. Enterprise Asia’s AREA Awards recognizes and honours Asian businesses for championing sustainable and responsible entrepreneurship, and held in four sub-regions of Asia, namely Southeast Asia, Eastern Asia, South Asia and West Asia.